A native of the Lehigh Valley, Travis Boyer began serving his clients as a financial professional in late 2005. Travis entered the field with Keystone Financial Management as a personal financial advisor. Growing out of this role, Travis accepted a territory and advisor team for M&T Securities. At M&T Securities, Travis expanded his services to offer Corporate and Executive planning as well as maintaining his personal clientele. In 2010, First Niagara Investment Services offered Travis an opportunity to join his talents with their company, and allow for the completion of his professional credentials. Accepting the role, Travis supported a large territory and licensed banker team, facilitated program growth as an Assistant Vice-President, and continued to offer Corporate, Executive and Individual planning services. In 2016, First Niagara Bank was sold to Key Bank, and the acquiring firm would close their relationship with LPL Financial. After careful consideration, Travis decided to remain with LPL Financial as an Independent Financial Advisor, and joined the advisor team of Secure Planning Group, LLC. In 2018, Travis expanded is services by adding a partnership with Wealthcare Advisory Partners, to offer products and solutions on a variety of platforms and highly specialized advisory strategies. 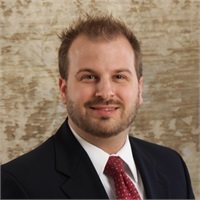 While having extensive experience in many fields, Travis has particular expertise advising clients in the healthcare, manufacturing, and education sectors (including PSERS educators and administrators). Additionally, Travis advises business owners and high net worth families navigate the strategic complexities of financial and estate planning, and succession concepts. Travis takes pride in working hard for his clients’ best interests and building long-term, multi-generational relationships. In his downtime, Travis enjoys spending time with his wife Stephanie and two daughters, Emerson and Vaeda, skiing and outdoor activities, and driving his Jeep. Travis is active with his local government as a zoning officer, and regularly volunteers with various organizations. If you have financial questions or concerns, please feel most welcome to schedule an introductory conversation with Travis today. Raised in the Philadelphia suburbs, Julian launched his career in 2017 as a risk management and protection specialist. Before joining Secure Planning Group, Julian operated and managed his family’s business for over a decade. His love for customer service and cultivating relationships focused on offering his customers more value. Transitioning into the financial services industry was natural for his customer centric mindset. Over ten plus years in management, customer relations and sales, Julian’s strength is building the long lasting relationships with his customers. In his downtime, Julian enjoys time with his family. As a recent restaurant owner and first time father, Julian enjoys spending free time in the kitchen creating memories with family and friends. His hobbies include weight training, running and trail walks with the family and dogs. Julian holds his life, health, disability, and long term care insurance licenses.